Abstract holographic flowers nail art | Light Your Nails! Today I am showing you how I made a basic grey (Catrice ICONails 19 Johnny Deep) a little more summer friendly thanks to an easy nail art. I picked an abstract flower pattern from Bornprettystore’s BP-L071* stamping plate and stamped it with 17 Holo Silver nail polish. As usual I sealed my nail art with Essence XXXL top coat. This stamping plate has got different kind of images and I feel like there’s no common theme. It could be interesting for starting with nail stamping and trying different styles. However it works great so if you like it just grab it! Do you like today’s nail art? Is it more summery than the base polish itself? È bellissima questa nail art!! Complimenti!! Prima o poi mi devo decidere ad acquistare qualche stamping di questa marca!! Your stamping is great, but that holo is gorgeous! 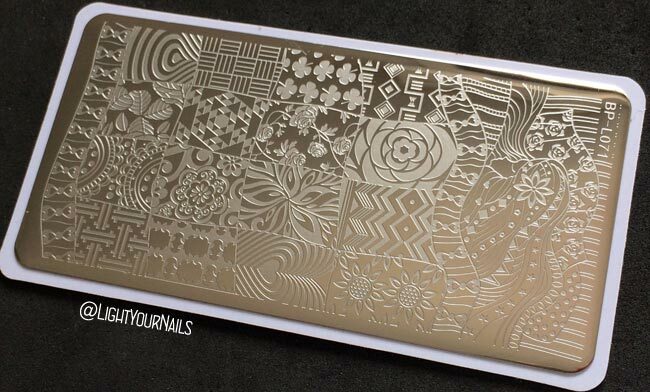 This stamping is so pretty! I don't know how popular or easy to find that holo actually is. It's a UK brand and I got it from a swap.